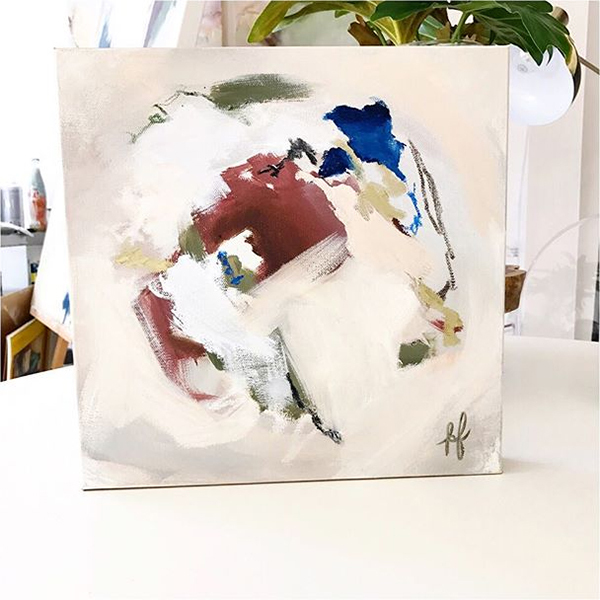 In September of 2015, artist Katherine Freeman began selling her work under the brand Katherine Freeman Original Art and today it is my pleasure to introduce both her and her work to you. 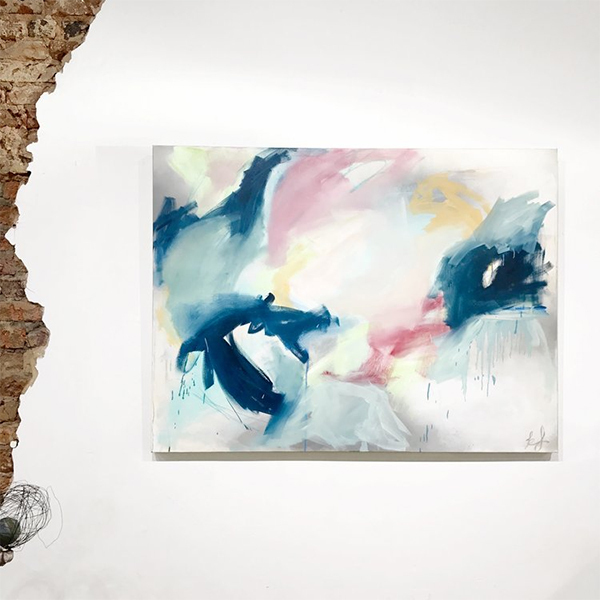 Her use of watercolors, oils paints, and charcoal lend to both serene and bold pieces that seem to pour from the canvas. Hi Katherine! 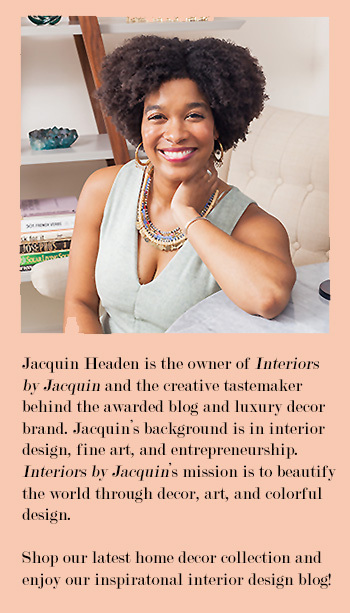 Thank you so much for taking the time to let Interiors by Jacquin readers learn more about you and your work. When did you did decide to follow your passion for art? Katherine: After graduating from The University of Alabama (roll tide) I got my Real Estate license and began work full-time as a Buyer’s agent for my mom who has been in the Real Estate business for the last 13 years. I was creating art on the side in my free time, so I decided to share my work via Instagram/social media. One thing led to another and people wanted to buy my work so I was like, why not? Getting paid to do something I am passionate about is more than a dream come true! 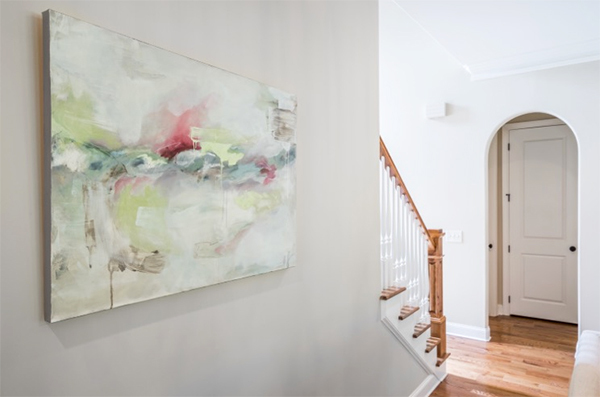 Katherine Freeman’s artwork shown in a residential interior. Artist Katherine Freeman uses clippings from magazines, fashion, & other media to inspire her artwork. What is your inspiration when you create? Katherine: Everything around me! 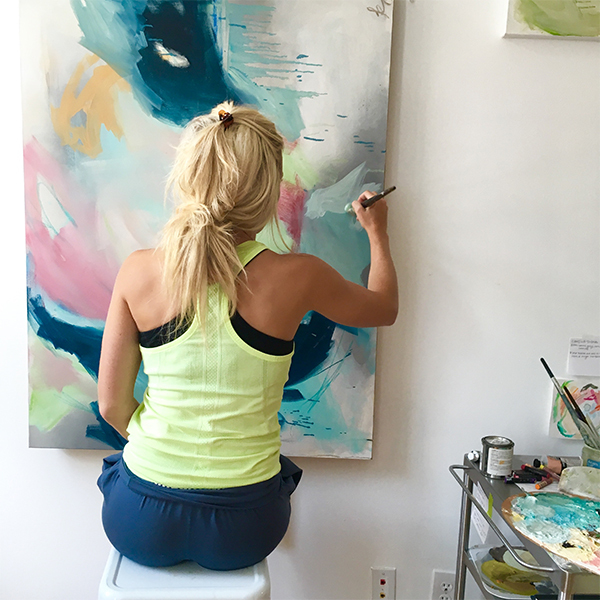 I have created my studio space to be all white, bright and airy allowing my work to be the color and I believe that has played a major role in influencing my style and various mediums that I use. I love bringing in magazine cut outs, any type of organic shapes, and sometimes even paint swatches to inspire my work. I am greatly influenced by interior design, textures, patterns, and the contrast between colors. 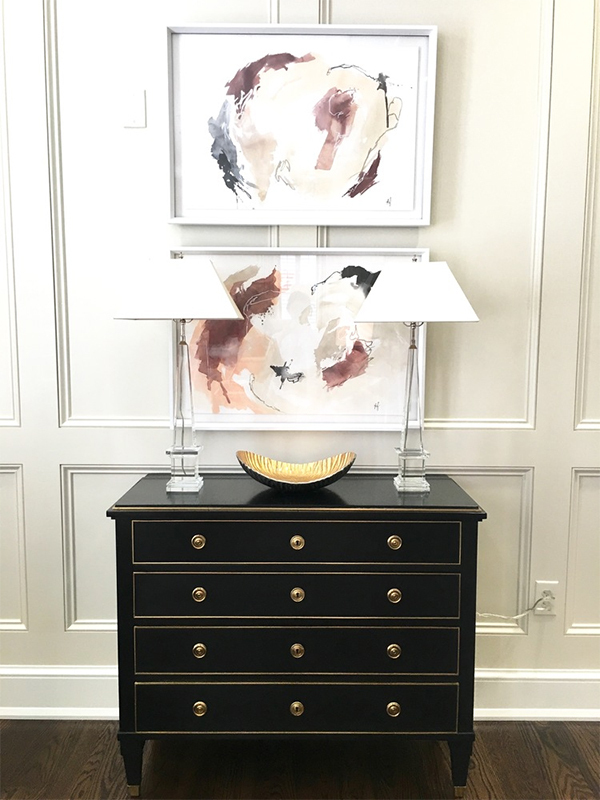 I enjoy following interior designer’s social media accounts and always love seeing the various trends and colors designers are using. I am no pro when it comes to interior design, but I do get such a thrill from looking and putting things together. I see amazing rooms and I instantly envision my work in them – that is how I know if I have created a good piece or not. 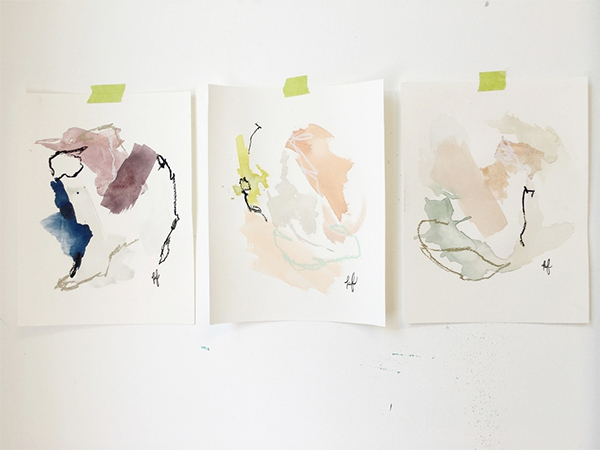 How does your art evolve from beginning to the finished product? 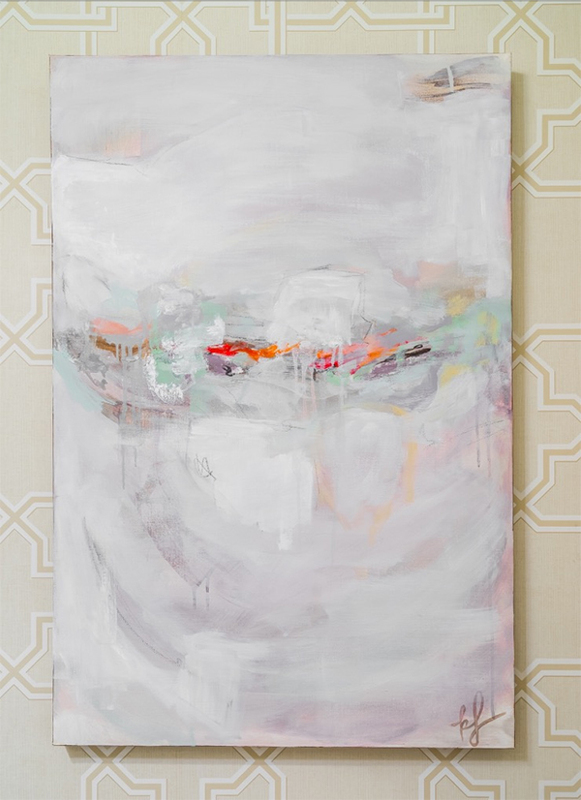 Katherine: Abstract art is such an intuitive process and my work is constantly evolving. 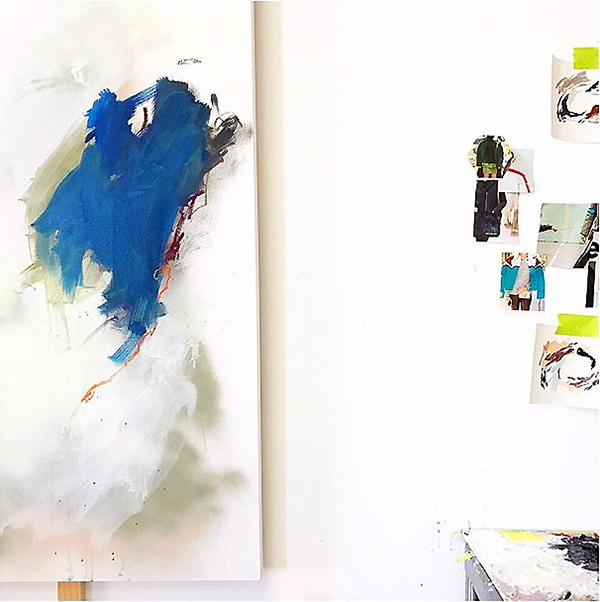 I do love working on paper, however I absolutely love working on super large canvases. To some people I think big can be overwhelming (I remember feeling that way at first), but to me, the bigger the better! I typically begin every piece with a similar process and that is usually applying very large brush strokes with whatever colors I may choose and then adding oil pastels to help find the movement and composition of the painting. What people don’t realize with abstract work is that you can’t be afraid to mess up. Some of my most favorite paintings have come from accidents made on the canvas that I quickly embraced, an then they became areas I didn’t want to cover up. Embrace your mistakes, because sometimes those mistakes can also be very hard to replicate!! Once I feel like I am finished with a piece I let it hang in my studio for a few days. I love hanging the piece so I can see it right when I walk in the door. Based on my first look when I walk in the door, my intuition always tells me if it’s complete or not. How does your passion and creativity for art flow into your everyday life? Katherine: I think art is more than just paint on canvas. Being creative in every aspect of my life challenges me to always be looking for new ideas whether it be in fashion, design, or art. I have a style and I believe my work encompasses that. I do want my work to exude positive feelings and emotions, so I try and surround myself with those everyday. With creativity though comes ideas galore, and my mind is literally always spinning! If you could choose any subject for a piece, what or whom would it be and why? Katherine: I would have to say I would choose my interpretation of people. It is something unexpected from me and I have not had a chance to experiment with yet, but hope to in the near future! 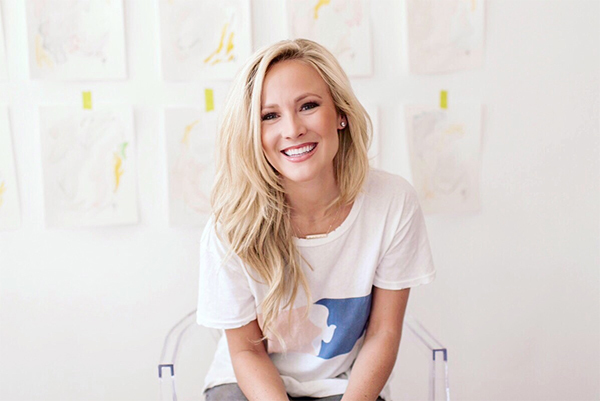 If you’ve loved the photos here, head over to Katherine’s site for more artwork, as well as information on commissioning a piece of your own. If you are interested in staying in the loop of all things Katherine Freeman Original Art, follow her on Instagram, Facebook, and Pinterest.